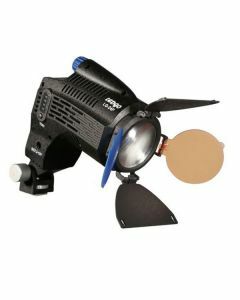 The Ledgo 24F is an on-camera fresnel light with a colour temperature of 5600K. The 24F has a stepless brightness control taking it from 0% to 100% as well as integrated barn-doors for further shaping of the light. In addition the 24F also has swing-away filters to add further alterations of the temperature of light needed.